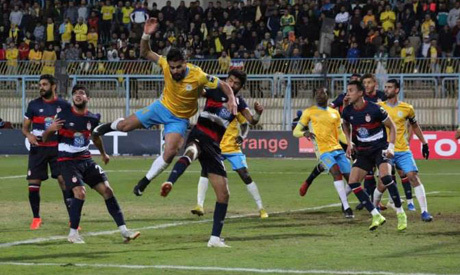 Egyptian side Ismaily have criticised the performance of referee Alioum Neant during their Champions League clash against Tunisian side club Africain, stressing that riots that erupted in Friday's clash were due to the referee's mistakes. The game was called-off with seven minutes remaining following crowd trouble at Ismailia Stadium on Friday while the Tunisian side was leading 2-1. The game saw many controversial decisions from the referee, who awarded two penalties to the visitors and refused claims for another one for the hosts. "Ismaily's management decided to submit an official protest against the Cameroonian referee to the CAF," read a statement in the club's official website on Monday. "The referee made many mistakes during the game that influenced the final result." The club's board asked the African governing body to open an investigation with the Cameroonian referee to discover the truth and take action. They stressed that they stand with the club supporters and understand that their reaction during the game was due to the referee's mistakes. "It is clear that our fans were provoked by the referee's decisions and we are confident that they will always back the club in all situations"
CAF is yet to reveal their decision concerning the game, with reports suggesting that the club could be heavily sanctioned.